In the late April we started our Eastern Europe trip. The challenge is to travel all summer long in the cheapest way. Already in the first week we felt that this summer is gonna be an unusually cold one. This may influence our idea of camping in the wilderness. We spent 1 week in Berlin, getting an alternative picture of the metropolis. Read our ultimate tips for Berlin. Early in the morning on a sunny day we decided, was the perfect opportunity to hitchhike out of Berlin. We had to make it to the outskirts of the city so we took the public transport – first a tram, then a bus. The prices for transport are excessive but luckily black riding is easy and common here so we made it without paying. We still had a long walk ahead of us. We tried every road we could find that leads to the highway. First we tried it at Grünau, then at Altglienicke. We had no luck at all. We met an Argentinian hitchhiker who had been trying to find a ride for some hours as well. Only one driver stopped and advised us to find a gas station next to the highway because cars driving at our place would generally not leave the city. Our spot seemed impossible so we wanted to give the gas station a try, but this ended up being a waste of time. It was 4 km down the highway with no way to access it on foot. Finally, we moved to another location: the roads leading to the highway near Schönefeld airport. The sun started to set and we were near the airport. 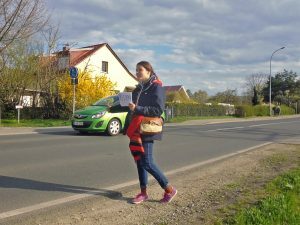 We were tired of walking – we walked over 13 km with luggage already. We sat down in the airport terminal. Surprisingly, this airport has free wifi and we were able to book a bus from there directly to Prague. We arrived at 4:30 AM. The old town center, usually full of tourists, was nearly empty. 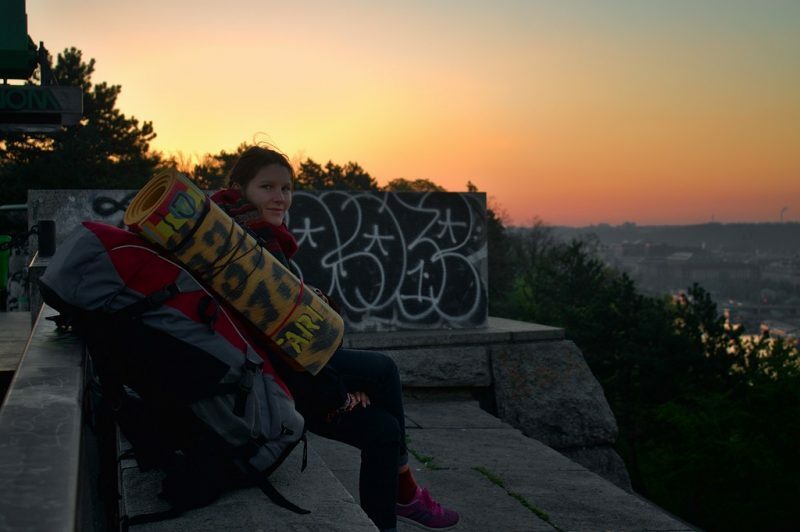 With some time to spare we slowly headed towards our destination, taking a break in Letná park where we could see the sunrise while sitting on the metronome platform. We were looking forward to having some rest but we still walked another 6 km before we arrived at our host’s place. We stayed for two nights and spent the following night in our tent in Šárka-Lysolaje park, about 8 km from our host’s place. 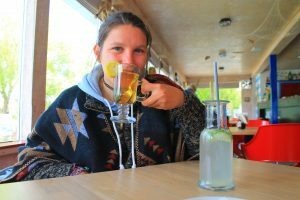 We hitchhiked to Pilsen from Prague. Getting a ride was easy and our incompetent driver drove nearly twice the speed limit so we made it to Pilsen very quickly. It was raining horribly when we arrived. Rain showers poured down from of thick, black clouds. We took shelter in the mall before we went towards the center. The first bus we took, drove us to the countryside instead so we had to walk back to get another bus. Our first impression of Pilsen was how trashy it looks. The streets were full of loud drunk people. They were dressed like gypsies and acted like them. We couldn’t believe that people who live so close to Prague could be that different. Even before we had the chance to see more of the city, we had enough of Pilsen. All we wanted was a peaceful getaway and all we got was a rainy cold village. As we didn’t want to pay for a hostel, we slept in a park. The rain stopped by and by, but the temperature was probably below zero. We covered ourselves with every piece of cloth that we had in our backpacks. As we were extremely tired from the walking, we didn’t feel much of the cold. We spent the first hours of the morning enjoying the sunrise until the trams started driving. Our limbs were stiff, our shoes wet and our motivation zero. We missed the gentle climate of Prague way too much, so we started to hitchhike back to Prague. It was the first time since we travel together that we experienced a wonderful encounter. We were approached with extreme kindness and helpfulness, very rare to find in these days. Once again, the road proved us to be full of mysteries and magical moments. It happened when we hitchhiked back to Prague. It didn’t take long until we were picked up by a friendly couple. They had to visit some relatives in Dobřichovice, a town close to Prague. They could drop us off somewhere but gave us the option to look around Dobřichovice until they came back to pick us up again. They had to go to Prague afterwards anyway. It was a beautiful area so we took our chance to see the countryside. We arrived at a riverside restaurant. They even offered us some food before they left us behind, taking our luggage with them. The meal was good. We didn’t see much of the town; we didn’t go far so we wouldn’t miss them when they’d come back. As promised, they did come back and drove us to Prague. We will be able to relax for some nights until we start our next mission: catsitting in Prague.